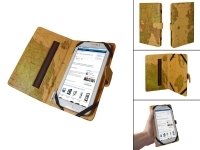 This Book Cover is an ideal accessory for your Amazon Kindle 4. Retro World Map on the cover and a convenient handle inside. Order at 123BestDeal.